The effects of father absence and the poverty that results from it are exacerbated by two supports lacking in the U.S. -- the lack of extended family and the dismal spending by the federal government on family-benefit programs. Children in father-absent homes experienced poverty at more than four times the rate of children in married-parent homes. Nearly 1 in 2 children in father-absent homes (46.5 percent) were in poverty compared to only 1 in 10 children (10.6 percent) in married-parent homes. The picture is worse for the youngest children. More than 1 in 2 children under age six in father-absent homes (55.1 percent) were in poverty. I pointed out that increasing the number of children growing up with their two married parents is key to reducing child poverty in this country. Data provided in the just-released 2015 World Family Map helps explain why U.S. children in particular need to grow up with their married parents. The World Family Map -- an annual report now in its third year -- monitors the global health of families by tracking 16 indicators in 49 countries, representing all regions of the world. Its global focus provides an important perspective on how well, or poorly, the U.S. fares on a range of indicators of family well-being. When it comes to poverty, families can typically turn to any of three sources for financial and material support -- their social network including extended family, non-governmental organizations (e.g. non-profits) and government programs. The level of support available from each source varies dramatically from country to country and even within some countries. It's vital to consider these supports to gain a clearer understanding of the extent of poverty's negative effects on children. The 2015 World Family Map includes data on two of those supports -- the proportion of children who live with extended family members (kin) and government funding of family-benefit programs (i.e. cash, services and tax measures) as a percentage of a country's gross domestic product (GDP). How does the U.S. fare on these two indicators? The proportion of U.S. children living with kin (29 percent) ranks 5th lowest among the 32 countries for which data are available. Only Canada, France, Italy and Ireland rank lower. The U.S. government spends a paltry 0.7 percent of GDP on family-benefit programs. That percentage is dead last among the 21 countries for which data are available, and is 36% and 42 percent lower than Mexico and Canada (the other two countries in the North American region), respectively. Extended family is perhaps the oldest form of support for humans struggling to survive. In addition to financial and material support, extended family can provide emotional and spiritual support in times of crisis and chronic hardship. It's easiest to access that support when kin live together -- the basis of this indicator -- or close by. The increasing mobility of U.S. families and the resulting distance between family members makes it harder to access this support. To be fair, there might be several of the other countries in the World Family Map for which data are not available on either indicator that fare worse than the U.S. So in reality, the picture might not look as bleak for the U.S. in comparison. The access to extended family indicator does not include access to family close by. But even when considering kin who live together, the U.S. has seen a dramatic rise since 1980 in the number of individuals living in multi-generational households, thus giving the poor more of this support. The U.S. is also a fairly charitable nation as it ranks 9th on the World Giving Index, a measure of the percentage of people in 135 countries who donate to charities. 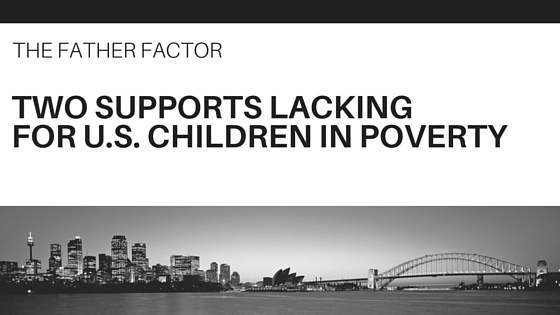 There are certainly non-profits to which poor families in the U.S. can turn for help. Nevertheless, the World Family Map reveals the lack of financial and economic assets poor families in the U.S. can access to alleviate at least some of the negative effects of child poverty. A vast majority of individuals in the U.S., more than 8 in 10, are not in multi-generational households. And the government spending data on family-benefit programs, with its downward trend, sheds light on the lack of importance our country places on government help for those most in need.